Comments closed! Winner will be announced tomorrow morning. Thanks everyone! Marie is the very talented owner of Knecht Ruprecht, a shop dedicated to handcrafted treasures for babies and children made from natural, organic, ecologically friendly and pure materials. I first came across Marie through Waldorf Mama and instantly fell in love with her creations. After my recent purchase of one of her beautiful lanterns, I thought I really needed to share her amazing work with all of you. I asked her is she would be willing to do a short interview and she kindly agreed. 1. What is your inspiration for your beautiful creations? My daughter Klara Alma is inspiring my work very much. She shows me in our daily life what is essential with dolls and toys in general and what is not. My claim in doll making is always to find what is essential, to limit it on that and put soul into my creations. 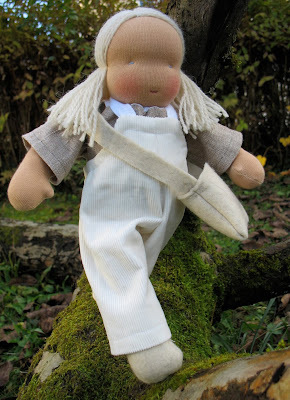 Also the memories of my own childhood spent in a very natural and rural countryside and also the processes going on in the cycle of the year in nature are a great source of inspiration for me as a doll maker. 2. We love dolls in our house. They are involved in everything that my daughters do. Why do you think dolls are so important to children's play? I would like to start my answer with Words by Shariffa Oppenheimer in regards to Waldorf dolls. "As the child nurtures & mothers the doll, he is - not simply metaphorically but also in reality - caring for himself. It is important therefore, that we offer a doll that closely resembles him/her, not so much in features but rather in proportion. The child's "felt experience" of the doll will remain with him/her. So let's keep the doll simple, proportional & tactfully truthful." It can be said that a doll for a child is something like the "second I". Everything learned and experienced by the child can be repeated in doll play. If the child is progressing something, the doll will do the same very soon, too. If the child is sick for example and has some fever, it's doll will get in contact with the thermometer soon too. 3. I read in your Etsy Bio that you grew up in an artistic family. How do you think that influenced you? I grew up in a family of artists, with lots of self made and handcrafted things around me. My parents made most of my toys by themselves. I was always around in the atelier of my parents and was raised to be creative very soon. Since I had my daughter, I started to make her things just like my mother did for me when I was a child. I just love all things handmade and unique and I choose to provide and surround my family and myself with beautiful and lovingly handmade goods. I think that things that are made by hand, using only natural materials, are instilled with a spiritedness that is not present in other kinds of things. 4. What role, if any, has your Waldorf education played in shaping you as a parent? Waldorf with all its facets feels just home for me. It is just natural and absolutely no question for me to parent "waldorf" since I felt very comfortable with it when I was young. Now, not only was Marie kind enough to allow me to interview her but she was gracious enough to do a giveaway, as well! This is for one of her adorable walnut babies pictured below. To enter, all you need to do is leave a comment, maybe even share your thoughts on dolls and their place in your child's life. I will close comments next Sunday November 29th at 6pm PST and announce the randomly chosen winner the following day in my Monday morning post. love the little walnut babies. my daughter loves little things...these are just perfect. we have a few dolls in our house. they are constant companions. they help inspire care taking and play. i often find my daughter with a babe in her arms nursing, rocking, singing, talking and playing with it. her favorite doll's name is "Me" and i just love that she sees herself in this doll and take care of it as such. I love these dolls. My kids all love to play with dolls, but my two-year-old especially does. Oh how fun! I'll play along! Those are adorable! My kids love their "babies", so I know these would be well loved! She makes beautiful dolls. My girls and their dolls are a constant thing. Such a great toy for nurturing and loving. I love these. Dolls, I'm finding, work so well as a type of sibling mediation in my house. I can show my son and daughter how to use gentle hands with our baby by using their favorite dolls--likewise, I think my daughter will be ready for a full-sized doll of her own soon and I couldn't be more excited about it! I grew up in Germany, and Waldorf dolls always remind me of the beautiful, well-crafted, imaginative playthings I grew up with. I long to give my baby girl the same delightful toys, but being a large family on a small budget, I will have to learn to craft most of these items on my own...unless, of course, I win something in a giveaway! Thanks for sharing the interview, we love dolls around here. They are part of the family and my five year old little girl especially loves being a "mommy"
Her dolls are so adorable!! I have 2 girls and they both love their "babies". Her dolls are so beautiful! My girls are 11 and 14.They still have all their Waldorf dolls and toys Dad made them.I think the dolls and toys are woven in with their memories of childhood. Thanks for the interview and the generous giveaway! Both of my girls are absolutely in love with dolls. I feel like they are almost constantly holding one. This is a super sweet giveaway! What a lovely interview! Thank you for the fabulous giveaway and Happy Thanksgiving to you both. Dolls were a very important part of my life as a child. I remember how real they were for me. I was very concerned about their feelings and even created a schedule so that each baby had her turn to sleep with me at night. I didn't want to leave anyone out! I am sure they will be equally as special for my kids too. Thanks for the giveaway! I absolutely love her dolls!! Beautiful dolls! Dolls are such a wonderful way for children to learn how to care for others. My son has a baby doll too, which I think is important as a boy - I want to teach him to take care and be gentle too! Wonderful giveaway! What a wonderful giveaway! I'm sure they will bring children such joy! My friends have always be amazed at how my girls have loved their babies from a very early age...as early as one my girls were carrying their babies or in a sling and acting like little mommies... the best compliment I've ever gotten was watching my girls care for their babies. It tells me I'm doing something right! :) Thanks for the chance to win these lovelies! Those are beautiful, with 2 boys - I think cars out win dolls most of the time, but I can honestly say that we need more dolls around our house :). I think that dolls are extremely important for the development of a child's playtime and verbal/social skills. My cabbage patch doll was an essential companion when I was little! :) I really regret not buying or making a special doll for my son when he was small. Everyone gifted him with cars, cars, and more cars. He never had any GI Joes, even. No sort of doll or action figure to act out life in miniature. He's eight now, so dolls are out, but if I am ever blessed with a second child, a doll will be the first toy on the list. Those are lovely dolls. I am right in the middle of making my daughter her first waldorf dollie. She loves her cloth doll that I bought her two years ago. These dolls are so beautiful. My daughter's dolls are part of the family...they go everywhere with us! They are gorgeous! My little girl would love the little doll in its own house! Thank you for showcasing her beautiful dolls! My son especially loves little "woodland" dolls. He is always out exploring nooks and crannys in the outdoors, looking for any signs of small animals, faeries, etc. He would love to find one of these! Her dolls are gorgeous! Thanks for sharing it with us. Beautiful dolls I love them! My daughter likes dolls but only the "tiny" ones, so this is perfect. we have always made our boys (9, 6 & 2) their dolls and a good many of their toys as well. thanks for sharing & for the giveaway! Elegant and spiritually uplifting....leaves me yearning to re-live my youth when simple treasures were the spark that enkindled the imagination. Thanks for sharing! Just wanted to share how I love Marie's dolls. The simple muted colors remind me of the root children. They are in my favorites on Etsy. Oh, my. My daughter loves nurturing her babies. This would be perfect! And my son would probably enjoy it, too, since we've been reading "The Mistress of Malplaquet" Beautiful dolls! Thank you for the giveaway. I love the sweet simplicity of her dolls! I have been wanting to make a waldorf doll for my daughter for eons, but I'm not sure I have the talent! I've admired her dolls for a long while! We'd love to give a little walnut baby a home. My first son received his first doll at three. It was a 5 inch blue knitted angora boy that looked just like him! Over the years I have made, with no prior sewing skills, a few more dolls to add to my children's collection and find that the toys I make for them or that we make together are by far their favorites, even when they are a little lumpy and crooked. Still, I was pleasantly surprised to find out that the kids think that every doll that comes into our home is made by me. Lol, they give me too much credit! Of course, I correct them and being that we are a family of budding artistic types I like to tell them as much about the maker as I can. They are very interested in people who "make" things and I have even heard them scoff "my mom could make that." I see how it gives them an immense amount of confidence and they really are willing to try a lot of things I think because they see their parents do so all the time--successfully or not so much :)Anyway, that has been our experience with dolls--not only are the great to play with, but making them has really fueled a lot of creativity and confidence in my family. Her dolls are beautiful! And the little walnut babies are so sweet. Yes, dolls are a very big part of childhood for my girls, and a big part of motherhood for me, as I discover the dollmaker in myself. I appreciate the advice to stick with what is essential. I make a lot of handcrafts and that comment resonates with me as I am also on the search for the heart of what it is we really need and what really nurtures us, as well as just what is the right thing to make to nail a child's needs for fun and an emotional connection. dolls are away for my son & daughter to learn to nurture and some day take care of their own kids. they are loved!! just the right size to carry in a little hand ! what sweet little dollies! my dd is 19 months and she's just starting to play with her dolls. Beautiful dolls! My little one is only 17 months and she loves playing with her dolls already. Thanks for the giveaway! These are such beautiful dolls. They are almost to pretty to be playthings! I have a six month old son and will be getting a waldorf doll for christmas. Many people have given me strange looks when I tell them this. Why? Do little boys not grow up to be men who inturn take care of their families? I want him to be a caring, gentle and compassionate man. I feel that dolls help to foster those feelings even in young boys. They are NOT just for girls as so many people think. I look foward to watching him develop a relationship with his doll and how he will grow to care for it. If he wants to carry it in a sling, "breastfeed" it like mommy, or whatever else is considered "girly" so be it. He is using his imagination and learning about the world the only way he know how, through imitation. I know that giving him a doll isn't wierd, it's all a part of childhood. I have 2 boys and I thought it would be all about trucks, but in between trains and tractors, they take the time to dress the babies, feed them and rock them in the cradle or in a silk sling! Thank you for sharing - it is nice to learn more about the artists behind their beautiful creations. Thanks for a really fun interview. I think there are so many truly important life skills that children gain from playing with dolls. My friendship with my doll Betsy was one of my very first relationships. She has remained my oldest friend... we are both over 50 years old now, and she still gets a goodnight kiss from me each night :) Thanks for a chance to win one of Marie's wonderful little creations. I've included a blurb on WFAs FB. Oh, I've admired her work as well. Beautiful! my daughter has several dolls - one waldorf doll that I made and the rest other kinds of dolls given as gifts from others. I am proud to say that the handmade one is her favorite. It goes everywhere with her and she cannot go to bed without her. 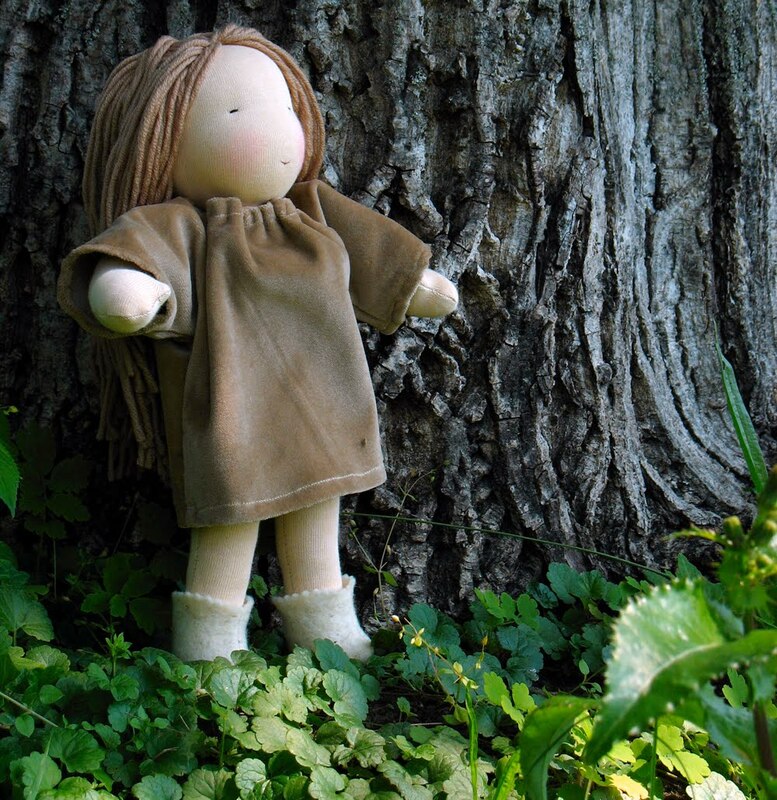 Thank you for the interview - a doll is such a personal item in a child's life. It becomes one of the family (at least this is what she constantly reminds us of). Having a personal connection with the dollmaker makes it even more special. Thanks for the giveaway opportunity. Beautiful creations that will bless whoever may be the fortunate owner! 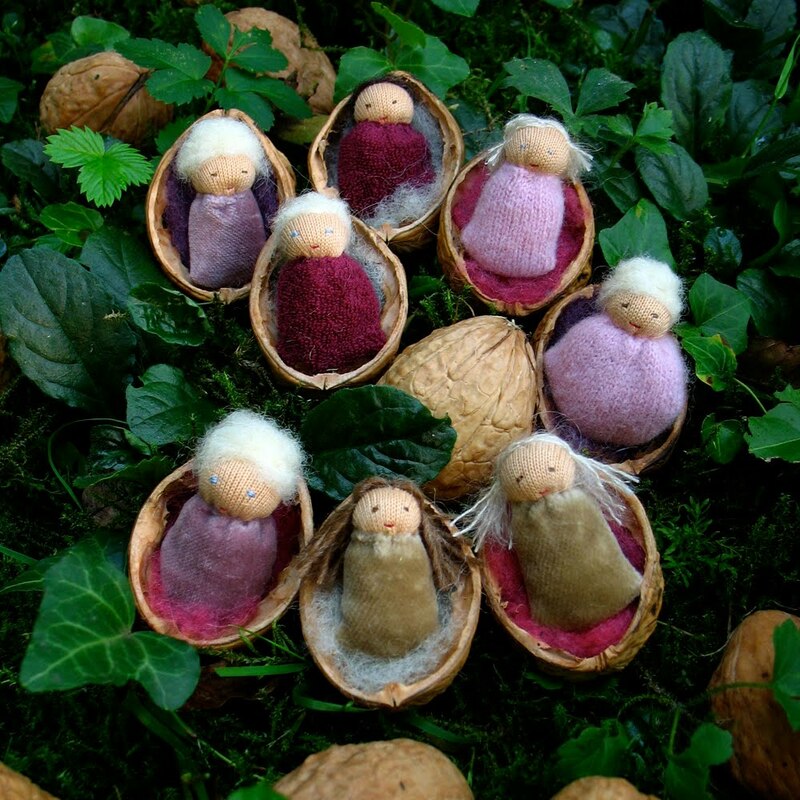 Thank you for sharing your adorable walnut babes...Please enter me in the contest. Those are adorable! Thank you for the interview! I love making Waldorf dolls and am going to make my second for our second baby soon! ohi do think xi needs one of these..hehe love you ni! Her dolls are gorgeous! I just bought one of the boy root dolls for my 1 year old. A walnut baby would be a great accompaniment! Wonderful interview. What a very talented lady! These dolls are so beautiful! I have been trying to get my daughter to love dolls (I have made several waldorf dolls for her) but she only has love for her teddy bears (originally mine when I was a kid). Some day, I hope. But she does love little fairies and elves so we have a whole miniature collection. very sweet! my little ones would love this! a really lovely interview and such a sweet giveaway! thanks for a chance to know another artist! Have a wonderful Thanksgiving! What a great interview! We love our baby here - although sometimes we love our giraffe and dog more. It depends on the day. Although we have a darling dollhouse - or "playhouse" as my husband calls it that one of these little babies would be right at home in. What a wonderful giveaway! I have 2 daughters, Magnolia (5) and Sienna (2.5). 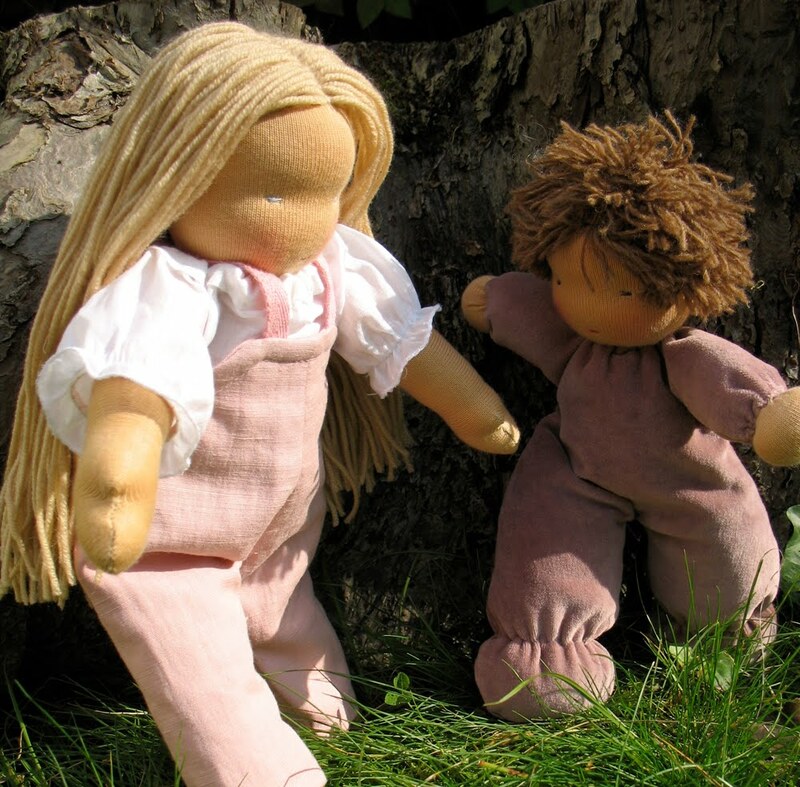 They both LOVE playing with their dolls and especially love natural hand made dolls! I am thrilled to be introduced to Marie and I look forward to checking out her blog! Thank you for your amazing kindness! What an amazing talent you have! My 2yo loves her plastic baby from grandma! I want to try my hand at making a lovely doll as you have. Thank you for the chance to win one. These are so sweet! My boys both love their dolls, though I have to admit, the 50 cent thrift store doll is my oldest's "baby" right now, with the waldorf one I made him only coming out to play when he wants him to jump on the bed with him! Thank you for the interesting interview. The dolls are lovely! Looks like these walnut babies will love to be taken care of!!! Lovely dolls. I adore watching my daughter and son play mom and dad with their babies. lovely dolls!!! thank you for this wonderful giveaway. When I see pretty dolls like these, I wish my daughter still played with them. Your dolls are beautiful. And the Walnut babies are so cute. What a great giveaway. All of these dolls are just precious. I have two little boys (2 years & 8 months) who play a bit more rough than I'd like and I'm hoping to use doll play as a way to slow and calm them a bit. They have a handful of tiny Under the Nile cloth dolls and I've been sewing little pillows and blankets for them and searching for baskets to use as beds. I don't know how into them they'll get but it's certainly fun for me. Heh. Dolls played a huge role in my life growing up and they are already an integral part of my daughter's play. She received her first doll as a gift from her Daddy and me on her first birthday. And now, with a new baby on the way, it is wonderful to see her gentle, caring nature blooming as she takes on the role of mothering her babies. My heart is so blessed everytime I see her cradling, feeding, changing and loving on them. I have two boys and a girl and think that dolls are important for all of them! We would love one of those little beauties! Until my daughter was 3 we were interested in "dolls" I thought they were stereotyped and the girls should be having more variety of play items. Then we came to a Steiner preschool and I realised the importance of dolls. The teachers and I felt that my daughter was distant to other children and that having a doll would assist her in feeling more nurturing to herself and play with a doll would encourage her to take the steps toward connecting with other children. So I went a long and made my first doll similar to the ones in the article. My daughter immediately connected with the doll took her to bed and to cut a long story short became more "social". She is 8 now and still takes that doll to bed with her and we were just giving some of her baby clothes away to a dear pregnant friend. I asked her to look thru the clothes to see if she wanted to keep anything. she immediately took some special clothes out and said they were for her doll and began to dress her in her baby clothes . So the doll lives on and I am thankful to "dolls" for their contribution to her life. ohh, they are wonderful !!!! !thank you for this interview!! The interview was delightful, and I always love looking at the beautiful dolls! They always seem to arrive with their own look and personality, don't they. My daughter has several dolls. She doesn't play with them everyday, but she often goes through a period of several days when they are her constant companions. She is nearly nine now, and is very active outside and with crafts and cooking with Mom. But she is my last child at home, and when she gets lonely, her "babies" come out, often being re birthed! sometimes they are her children, sometimes they are her "sisters" but they always come to the rescue when she is going through a lonely time in her life. Every time I see these dolls, it inspires me to start my own creative juices flowing and make some for family and friends. Thanks again fo rthe inspiration! How lovely and so tiny. What beautiful work. My daughter Bess loves dolls and would be delighted to have one of these simple sweet dolls. This was a great interview with a very talented lady!!! Our dolls are so much a part of our lives and seem almost real to my children. My happiest moments are seeing the little loving things that I do for them imitated during their role play. Please include me in your generous drawing. I love these little adorable walnut babies! 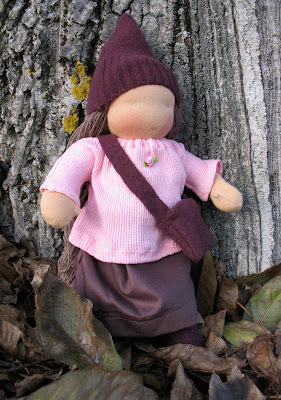 I know Knecht Ruprecht from various Flickr groups and different blogs online and love all dolls and creativity! I'd love to win one, to cherish and hold on a special place in our home. They feel like a blessing! What a cool post! My daughter is surrounded by three brothers, so she is kind of the princess around here. It's so funny for us that, despite all the boy stuff in our home, she loves her baby dolls so much. She carries one under each arm, pretends to nurse them, and says they are her babies. She names every dolly after herself (Lucie Grace) and screams at the boys if they so much as touch them!! I am in love with Waldorf dolls as much as my children are. We have quite a little family of Waldorf dollys at our house, I even have my own and I already know of another one that will be joining us in December! 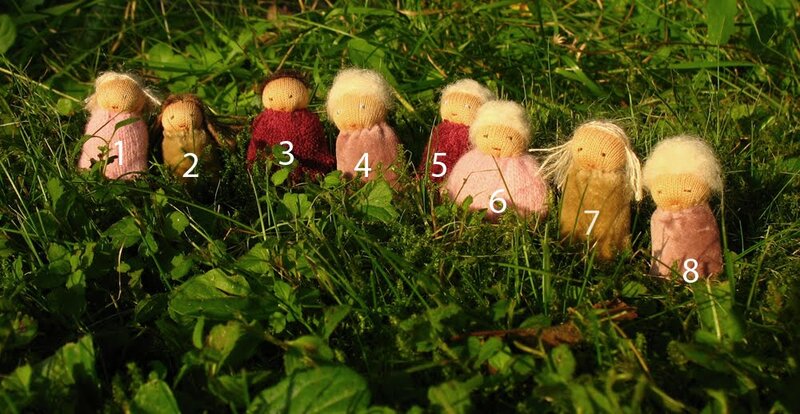 Such gorgeous dolls here, so lovely to see such a sweet giveaway thank you both for the chance! What beautiful dolls! We cherish our Waldorf dolls in our home, some of which were made by my Oma. 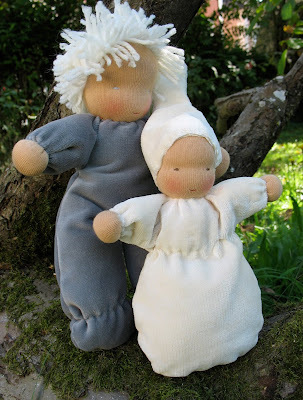 Waldorf dolls always have such a sweet spirit about them and Marie does an exquisite job of capturing the magical simplicity. Thank you for sharing such a lovely interview! What a great interview, thank you for that. Yesterday I witnessed a moment of absolute delight and joy when my little girl found her favourite toy warm from the tumble dryer! Oh how cute! I love them! We "only" have two Waldorf dolls and they are well loved. "sleepy baby" has been unofficially passed down to the baby and our fairy has beeswax crayon on her face. The girls play with them everyday and I actually like it that I can see how much they are loved. Beautiful dolls! My little girl would love to mommy one of these. Thank you for the opportunity! What a nice interview.... I was a doll lover as a child and its so neat to see my little girl being such a little mommy to her dolls. She is getting a Waldorf doll for Christmas and I hope that she loves it! Her dolls are amazing. I am Momma to 9, and 2 of our 7 girls have come to us from family members who lost them into foster care. We purchased them the 12 inch dolls from Nova Naturals, and they are so bonded with their babies, which has been wonderful therapy. I am saving up to get some bigger friends from Marie. Her dolls are AMAZING! I would love a chnace to in one of her beautiful creations. what a great giveaway! Thanks! Dolls are a play staple around here! these are beautiful!! count me in!